MARY FEDDEN. TULIP AND PEARS IN LANDSCAPE. Mary Fedden’s skill as a draughtsman and illustrator is undisputed. Her drawings are striking and exquisite with superbly controlled lines. These drawings are not the notations or ‘jottings’ of an artist using drawing as an aide-memoire but large, finished compositions. They are in no way rough sketches in preparation for subsequent oils or watercolours; they are designed to be exhibited and sold as works of art in their own right. Indeed, many of Mary Fedden’s watercolours often reappear as oils, or vice versa, some times in many different versions. However, her drawings tend to be unique in every sense – you rarely, if ever, see more than one version of a Mary Fedden drawing. 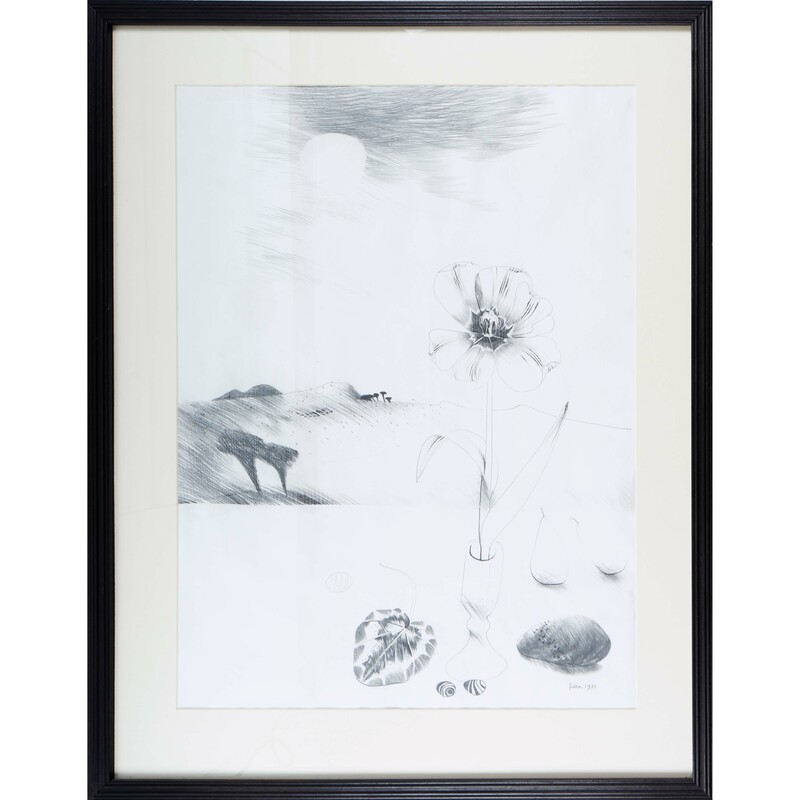 This drawing, Tulip and pears in landscape, is one such highly finished work, dating from 1973. It depicts a typical table top of familiar every day objects against a backdrop of a rural landscape. It is difficult to know exactly where the landscape is located but many of Mary Fedden’s drawings from the early 1970’s are set in Italy or France. The admiration which Mary Fedden’s early drawings received led her to collaborate with master printmaker Stanley Jones of Curwen Press. This allowed her to share her drawings with a wider audience, enabling more and more people to enjoy her work. 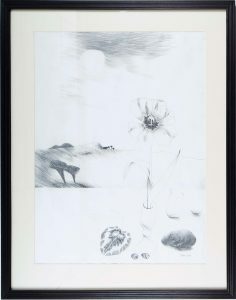 The result was a series of lithographs, created during the 1970s, worked on personally by Mary Fedden at Curwen Press. MARY FEDDEN. TULIP AND PEARS IN LANDSCAPE. Available for sale – please contact us for further details.